The Malaysian textile industry occupies a prominent position in its economy. In 2011, the Malaysian textile industry was the country’s 10th largest export earner and its exports consisted of yarn, woven fabrics and manufactured apparels. 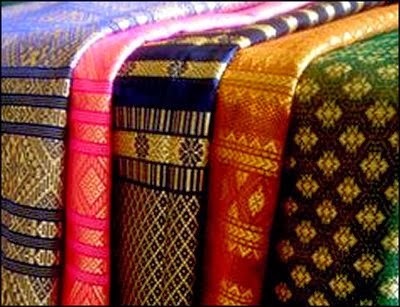 It is hardly surprising that Malaysian textile production plays such a vital role in its economy, for all of Southeast Asia is renowned for its wide range of textiles, many of which are the product of indigenous development while others have been developed using traditions, which hail from the around region. Traditional textiles and embroidery in Malaysia are valued not only for their functionality (their use as apparel) but they are also highly valued for their beauty and status for instance the sumptuous songket was a fabric at first exclusively used by royalty. The development of textiles and weaving techniques in Malaysia was allied to the discovery and use of new materials like tree bark and fibers in pre-historic times and to cotton, silk and textiles adorned with gold threads and dyes in modern times. The Malay term ‘kain’ which translates as cloth in Malay usually refers to any textile produced by a weaving technique. The east coast of Malaysia has historically been associated with much textile production like the art of batik textile printing, the manufacture of silk and production of the rich and elaborate songket/sungkitt fabric primarily used by royalty and ceremonial purposes. Batik is in fact considered to be Malaysia’s national textile and innovations in its production and new reasons for its use are constantly being discovered. While the production of songket is largely limited to the eastern Malaysian states of Kelantan and Terengganu, batik textile production is more widespread around the peninsula. Historical records indicated that the art of Batik textile painting was imported into Malaysia from neighboring Indonesia during the reign of the Melayu Kingdom of Jambi in the 7th century. Trading relations existed between the kingdom and various textile production centers on coastal Java and this is how perhaps the art was brought to Malaysia. 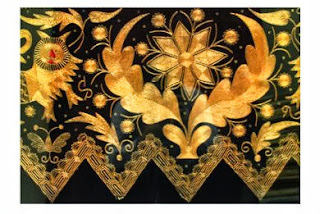 Initially Malaysian artists produced batik using either the Tulis or Conteng method (using a pen filled with hot wax to create a design on the fabric and then filling the outline with color) or tthe Cap method(applying hot wax onto the cloth and then using stencils made of tin or copper to impart the design). Nowadays, these traditional methods of batik textile art have been replaced by methods like free-style drawing, tie-dying, silk-screening and block printing. 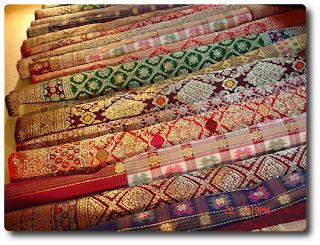 The origins of the creation of the rich fabric songket also known as sungkitt can be traced to the courts of the eastern Malaysian state, Kelantan. It is believed that this ‘cloth of gold’ was initially created by using gold and silver threads sourced from India. Indian traders had long been visiting the Malaysian peninsula and these threads were brought along by them. The opulent songket was produced by hand weaving these threads into the fabric. 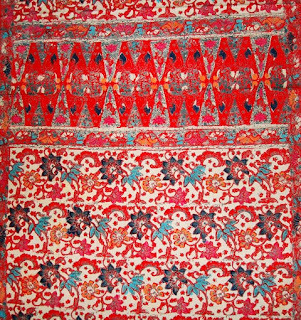 Today, this rich fabric is used to make wedding attire, dinner jackets, handbags, table cloths and other soft furnishings. 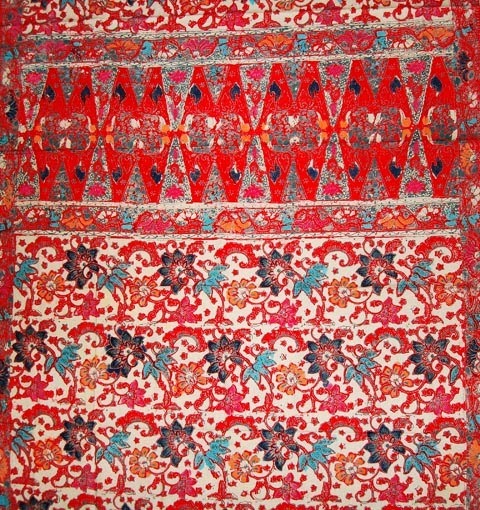 Tekat is the art of embroidering gold thread onto a rich base material generally velvet. Tekat is an art which has been practiced by communities on peninsular Malaysia for many years, though the Malaysian state of Perak, where it is known as tekat bersuji or hiasan suji timbul is especially known for the art. Historical texts mention that the tekat style of embroidery was used to adorn royal robes of the Melaka sultans. The Chinese traders were thought to have brought the art of tekat embroidery to Melaka and it came to be used extensively by the local Peranakan community. From Melaka, tekat spread to other parts of Peninsular Malaysia like Johor, Selangor, Pahang, Negeri Sembilan and Perak. Perak, however, is thought to have the highest quality of tekat work in Malaysia. Tekat embroidery is used to adorn ceremonial robes, wedding attire, betel nut containers, bedspreads, cushion covers, fans and more. However, the Malay tekat designs differ significantly from their Chinese antecedents. While the Chinese designs of Tekat embroidery usually featured animal motifs like dragons, birds of paradise and phoenixes, the Malay interpretations of tekat features plant and floral motifs and geometric designs.